Beautiful by the pool! Very comfortable Love this look! 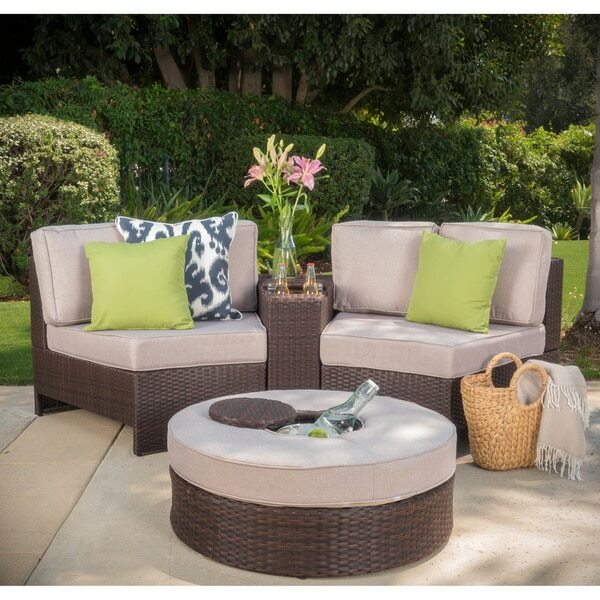 This stylish patio seating set includes two or four quarter sectional sofa seats, and umbrella holder wedge table, and your choice of an ice bucket ottoman or regular ottoman. Constructed from aluminum with brown wicker and water-resistant seat cushions. Choose from a variety of fabric color options to match your backyard style. Note: Quarter sectional dimensions are for each individual sofa seat. Pleasantly surprised that this set was exactly what I wanted. 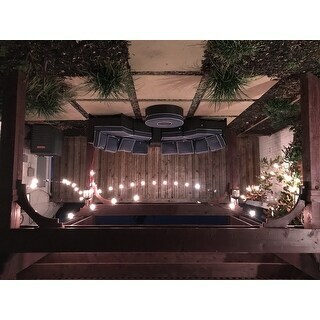 I was a bit concerned that it would be too small on our very large deck but it looks great! It's very comfortable as well and it only took my son and husband about an hour and a half to put together. The ottoman with the ice chest is smaller (in height) than the ottoman without one but it still looks great! 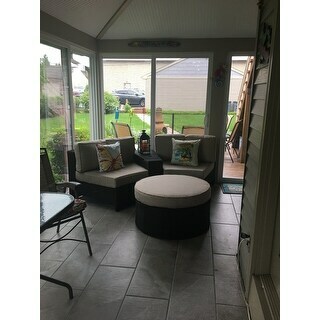 Great value and fits well in a 10’x10’ area. Clamps to connect sections are difficult to install. 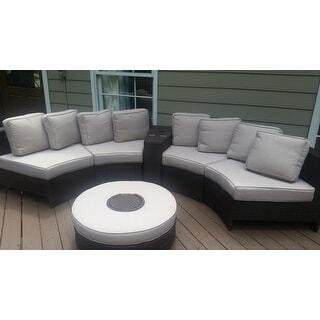 I ordered the Madras Ibiza Outdoor Wicker Sectional set with the ice bucket ottoman for my backyard beside my pool. It is super comfy, very nicely made and very easy to assemble. I ordered the small set first to see if i liked it and I LOVE IT! Im getting ready to order the bigger set! Well worth it!!! The set was exactly as described and pictured. The cushions are very comfy and do not need a break in period. Assembly was about 1.5 hours by myself. I did need help getting the clips on that hold the individual pieces into one unit but once we figured the best way given the curve of the piece it was pretty quick. One downside is that I was short two clips and had to only use one on either side of the center table. Also due to the curve the end back cushions tend to get out of position and even fall off. It would have been a better design to have a way for the ends to hold the cushions in place but I understand as it is designed to expand and add additional sections. All in all I am an Overstock fan and continue to buy for the quality and service. We have a small enclosed porch with 6 ft sliders in a corner area and this grouping worked perfectly in the area. The ottoman is in the way when we have a group of people over but we moved off to the side and it provided additional seating. We did get black and white Velcro and attached to the pillow on the back of the seats and the pillow on the ottoman to keep the pillows from sliding. Hopefully it will hold up. We are very pleased with them. I love this set! I wish I would have bought the extra seating to have it seat six, but I still love my two-seater. It is so easy to put together, and so light weight. I put the pieces together by myself, and I'm 108lbs with MS, so you know it's a breeze. I highly recommend this set, but order the 6-seater. This is a quite lovely seating set. I purchased the navy blue with white piping. Looks very good and is comfortable. 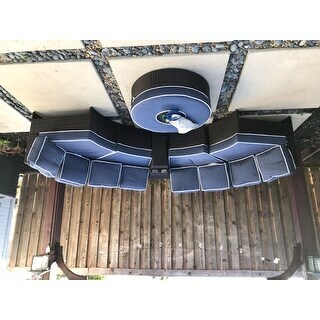 This is a well made set and fits perfectly on my bedroom patio. You can leave it out in the rain and when it dries it looks just as good as it did before it was rained on. It looks even better in person than on the website. I love it and you will too. We LOVE this sectional...we needed a spot to sit on our porch to watch the kiddos play on the driveway, and this is perfect! 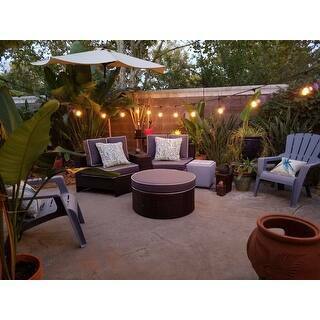 The center has a spot for an umbrella and 2 cup holders, and the ottoman keeps the bottle of wine nice and chilled! Easy to store for winter due to size and weight. Navy color is nice. Very easy to assemble. I paired it with a bold orange multi color rug from Overstock. 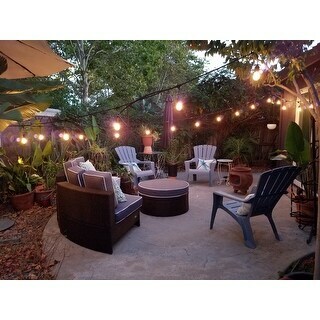 I absolutely love the look of it and the size is just right for my patio because I also have a table with 6 chairs. I did buy decorative pillows, 1 for each side, again looks great but when you sit on it the two back cushions tend to separate and the end one falls off and that is a bit annoying. I would definitely suggest my friends try this. I got the set in denim blue. It looks really nice by the pool! Very convenient. Nice outdoor set. Only issue is that the pillows for the back are in two separate pieces and they keep falling off the chair when seated on it. Would have been ideal if they came in one piece. I love this patio furniture! The only reason I gave it a four rating is that I couldn't fasten the clamps that keep the pieces together and we couldn't use all the screws to secure the back pieces to the chair because the holes didn't line up. I think it's secure enough to sit back on. I just wish the screws had all worked. 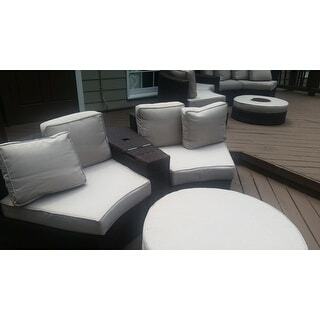 I can't wait for the spring so I can sit outside and REALLY enjoy the set with white wine chilling in the ice bucket in the ottoman! I even bought covers on Overstock to keep the furniture looking nice. This set is beautiful, looks exactly like the photo. 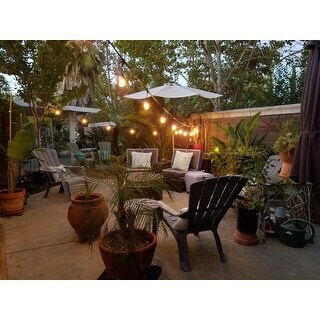 The best part is that its small and comfy for small patios. the only complaint is that the cushions do not stay on, they keep sliding off onto the floor. I bought these items for their beauty, but they have proved to be very sturdy and durable. Anyone familiar with the weather in the middle of our great nation, knows that the temperature may increase or drop within a few short hours, which destroys many outdoor products. This product I would gladly recommend to anyone, plus family and friends for it's beautiful, creative atmosphere and durability. "Is the cushion fabric Sunbrella? If not what is it and is it water resistant?" "What is the width of a quarter section when measuring the back of the piece? The width on the diagram appears to be at the front of the seat, which is narrower than the back of the seat." The overall width is 32.30 inches. The seat width 20.50 inches. "I purchased the Madras Tortuga 5 piece set and am having problems with the cushions constantly sliding off. I'm thinking if I purchase the wedge tables it might help. Any suggestions? Can I buy the tables separately?" We don't currently offer the piece separately. "How much weight does this hold. Have large family members"
We don't have a set weight capacity. However, we don't recommend anything heavier than 170 lbs for our ottomans. "Are the seat height Dimensions 17 in with or without the cushion on top? What is the chair back height?" "Can I purchase the wedge table separate? I want to add one to each end of my set to help hold the cushions in place and to have cup holders on the end"
Unfortunately, the wedge table is not sold separately. "Where can we buy furniture coverings for the 6-piece set, please? Does the company make them? Thank you." Unfortunately we do not manufacture a cover for this item.